We watched the Arsenal game against West Ham last night, and after West Ham had taken a 1-0 lead, Arsenal’s class finally showed through and they scored three goals to pick up all 3 points in a 3-1 win. That takes Arsenal above Everton in the league with the Toffees at home to Crystal Palace tonight, and they are expected to go 2 points above Arsenal with only 4 games to play. The Arsenal game was important for Newcastle, because West Ham are in 11th place, and they are still 9 points behind Newcastle with only four games to play – so it now looks almost certain that Newcastle will finish in the top 10. Newcastle are currently in 9th place – 2 points behind Southampton who are also slumping, and have lost three of their last four games – the only win coming against Newcastle, when they shamed us 4-0 at St. Mary’s Stadium. Stoke are 3 points behind Newcastle, and they could still catch us, but that would still leave us in 10th place. So it looks like the lowest position we will finish in is 10th place in the league – and if we can say beat Swansea City and Cardiff City at home, there’s even a chance we could overtake the Saints and finish in 8th place. 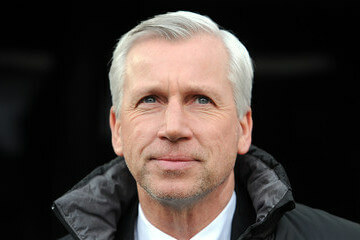 Does Alan Pardew have any ambition? If he does get Sacked will he ever get a job based on what he is doing here? As some pointed out Target was minimum 10th So he got us the minimum. Cup was not a priority! so he got us ousted at the very first hurdle. A good manager should always look to Beat the target, not barely meet it. a good manager could have gotten us to QF/SF and 7th and 8th, Pardew got us 10th as it will be and got us knocked in the first round. The biggest worry for me is that we’ll beat Swansea and play a decent game. Then Pardew will take the credit and paper over a gaping hole and act as though we never had this shocking run since Christmas, playing the big wig again. A manager that meets his boss’ beginning of season target, even after his boss sold his most valuable and integral player mid-way through the season and deflects blame to anyone and anything other than himself / the owner. That’s a lot to give up for a man who doesn’t like to be challenged. HD…For me, there is no incentive for anyone at the club to better themselves and in turn the club. Such a demoralising atmosphere. Pardew will have his hand in that no doubt, but he’s not the one that ultimately controls the targets of the club. Could he have done better, for sure. Geremi…Indeed. It will only take a Debuchy assist for a Remy goal and a NUFC win for Pardew to be able to claim he’s perfectly justified with his views. To some extent he is right, they are two of our standout players, it’s the manner of how we collapse without them that is so mental. …in light of that I have to admit worse case scenario (thank you WHam among others) cannot be finishing 16 but 14 it seems! Same old arguments again last night I see.Manx I do see the validity in your arguments pal but jesus do you go over the top ! Online-Sensationalism as ever,Krull leaving now as well I see.Is he leaving because of Benny as well ??. Well Ed shall we give ourselves a pat on the back for finishing an amazing 10th in the Pl,Probably as this is wher most at the beginning of the season thought we would finish,Alot on here in the bottom half.